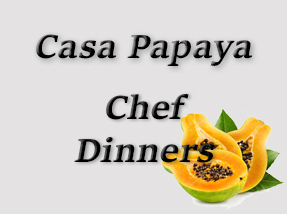 April is here, it’s beautiful on the roof and in the courtyard, so why not join us for an elegant chef’s dinner and/or a fun and casual Sunday Pizza on the rooftop here at Casa Papaya! We’ll be closed for the month of May, so here’s your last chance for a while to dine with friends, or make new friends, while experiencing chef Lee’s creative cuisine and Richard’s fabulous cocktails. Please call us at 152-7014 for more info and reservations, or email us as soon as possible. We’d love to see you before our month off – but no worries, we’ll be back in June for more food and fun! If you haven’t yet tried Casa Papaya for sup, you’re in for a treat. The hosts, Richard and Lee, are beyond gracious and welcoming, and the cooking is top-flight. A group of us met the other night for their every-other-week Pizza Sundays. Home-made sausage … vegetarian with more richness than you can imagine … and the kind of crust that only comes out of (an amazing) wood-fired oven. They also offer twice-monthly Chef’s Dinners, with fancier fare. We’re planning to attend the next one. These guys have spent a lifetime in restaurants, and it shows. They’re located on the same road as Sapasma, less than a quarter-mile from the turn-off; I forget the number, but there’s a blue door and a small sign. Their website is casapapayasanmiguel dot com.